Home / Reviews / Kids / Are headphones safe for your kids ears? Are headphones safe for your kids ears? I am a guilty grandma and let my grandkids play with my phone and have actually bought them both tablets to play games on and do coloring and the like. They have both used the tablets with headphones and ear buds, and I honestly never thought anything about it, until Rokit Boost asked me to review the new Chill Headphones of theirs. With Chill Headphones you do not have to worry they are specially designed to keep your children’s ears safe while still letting them have an amazing sound experience. They have a volume limit, and go over the ear NOT over the ear. These are so comfortable, durable and look really great on kids, they do not look like they are drowning in grown up headphones. Did you know that headphones that go too loud are dangerous to your child’s hearing? I did not know that I never even thought about it, even though I know that headphones are pretty loud. 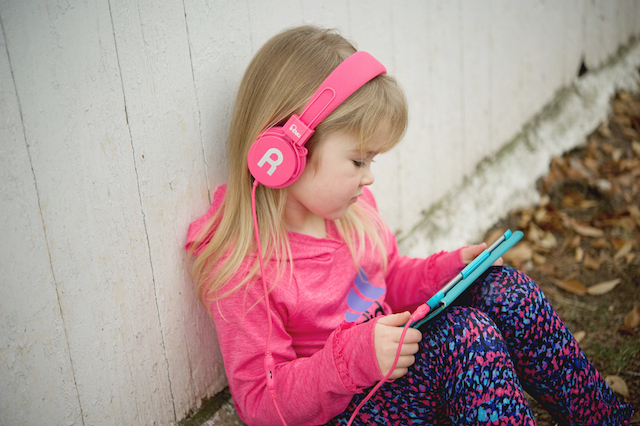 Chill headphones for kids are volume limited to 85db, so you can keep your kids hearing safe. The great news is the sound quality is still fabulous! You do not have to listen to things so loud that they are damaging in order to get great sound. One of the things that I loved the most is how lightweight they are, those little heads with grown up headphones are not such a great thing. Their heads are tilted and I know it has got to hurt their necks no wonder they never want to use the headphones. These Chill Headphones are perfect for kids 4 and up an they come in Pink, Red and Black, so they can fit just about any child’s taste. I am so grateful to Rokit Boost for introducing these to me and I have already ordered a pair for my grandson and I will recommend them highly to everyone who is having children use adult headphones. You can order them at their website here or on Amazon.